The last time I saw John in concert was on March 18 1997. It was at Cardiff international arena. On the first anniversary of this date I wrote these poems. The roads lined with daffadils on that early Spring day. We drove home in starlight through dark, wooded mountains. 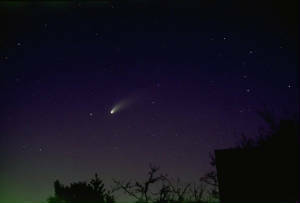 The comet was hanging to light up our way. And the time in between - two wonderous hours. Of the beauties of Springtime - your voice clear and strong. We listened in stillness, in sheer exhultation. And when it was over, we left full of magic. We drove home through mountains and woodlands of pine. But kept his vision and his dreams. He helped us celebrate our joys and bear our tears. We felt we'd lost a friend and brother. He opened up the ears of East and West. "Let us begin", he said, to listen and to learn. To start us down the road. I'll join with others and teach the world to love. For good must come from out of all our sorrow. Above - This lovely picture, 'Dreams' by Nancy Anglin, is also a link to her site. 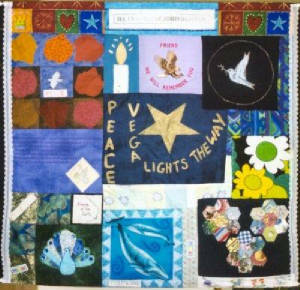 The John Denver memorial Peace Cloth has been created by hundreds of his fans and friends from all over the world as a visible expression of his message of peace. The hundreds of different panels stitched together symbolise collective prayers and wishes for peace. It was originally created to be part of World Peace Day at the United Nations on September 19 2000. Since then is has continued to grow. It has been taken to many places. When I visited Pacific Grove in 2000,I saw it there. It was incredible to find the piece of cloth I had sent lying on a beach thousands of miles away joined to hundreds of others. The symbolism was so strong. Do visit the Peace Cloth Site.